API adoption in large organizations has been taking a few years and is along a path of increasing business value. On one hand, we see some innovators realizing the need for immediate change, perhaps because of an impending threat. They go directly to embracing all aspects of transformation including enhanced customer experience, higher process efficiency and business agility and also a revised business model leveraging external innovation and a growing ecosystem. 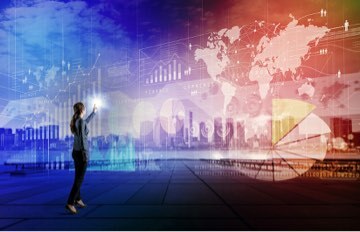 On the other hand, many companies approach digital transformation in an incremental way by addressing specific business and IT challenges as they surface. It’s important to understand however that business value of particular projects increases from left to right on the curve above. Some timidly look to increase only operational efficiency by modernizing IT infrastructure. Valuable yes, but even more valuable if delivered in the course of improving customer experience or building digital ecosystems. 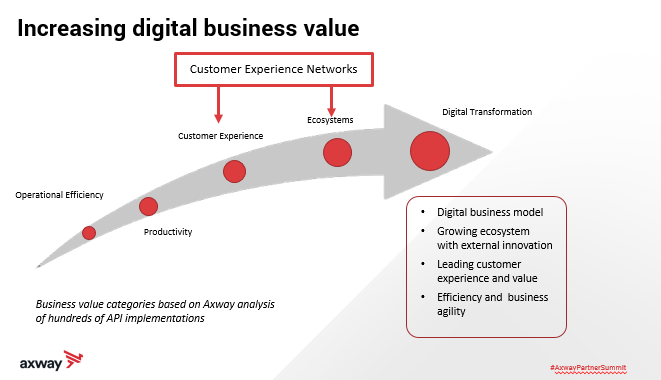 By owning or participating in Customer Experience Networks, the perceived value is multiplied and the network effect creates exponential value. The more business value your efforts can deliver will result in greater impact. In this rapidly changing digital world, faster has never been more important. It’s important to look at digital business strategically, and not just focus on projects but on building the ability to adapt to continual change. This requires the right foundational set of capabilities to support you as you go along your transformation journey. Full digital transformation project with APIs at Olivetti, the Digital Champion for Telecom Italia group: creating a platform delivering a new set of innovative services to external developers and communities in large, small and startup organizations + building a marketplace of monetized APIs. Full digital transformation project with a new Data as a Service business model thanks to APIs at Dun & Bradstreet. API adoption for improved operational efficiency at Scania who improves agility with better integration and security between applications. API adoption for greater customer experience thanks to Customer Experience Networks at ANZ with immediate payment initiatives. API adoption for partner ecosystem growth in the healthcare industry at OneHealthPort. Read more about open banking adoption with the help of APIs. Previous articleWhat size for your microservices?